The Taking marked my return to Dean Koontz after a break of many years and quite honestly I expected more. The plot started off well but soon turned into a War Of The Worlds re-hash. The ending was predictable and I figured it out early on. Don't get me wrong, this book is enjoyable but doesn't give the reader anything new. The blurb on the cover promised a twist at the end but I'm still trying to work out what it was! 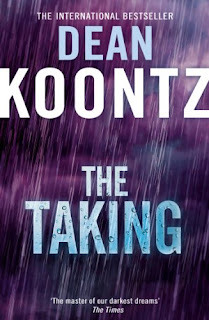 In my opinion this is one of Koontz' lesser offerings. On the morning that will mark the end of the world they have known, Molly and Neil Sloan awaken to the drumbeat of rain. It has haunted their dreams through the night, and now they find an eerily luminous and silver downpour that drenches their small Californian mountain town. As hours pass they hear news of extreme weather phenomena across the globe. An obscuring fog turns once familiar streets into a ghostly labyrinth. By evening, the town has lost all communication with the outside world. First TV and radio go dead, then the Internet and phone lines. The young couple gathers together with some neighbours, sensing a threat they cannot identify or even imagine. The night brings strange noises, and mysterious lights drift among the trees. The rain diminishes with the dawn but a moody grey-purple twilight prevails. Within the misty gloom the small band will encounter something that reveals in a terrifying instant what is happening to the world – something that is hunting them with ruthless efficiency. Epic in scope, searingly intimate and immediate in its perspective, The Taking is a story of a strangely changed and changing world as apocalypse comes to Main Street.